Prior to the plant tour, he met with Plant Manager Todd Scherer. Around the table visiting the plant with the Governor are, from left, Parson, State Senator Doug Libla, 149th State Representative Don Rone, Kyle Aubuchon, Boards, and Commissions Director for Governor Parsons; Chad Hill, Portageville resident and Materials Manager at SRG Global; and First Lady Teresa Parson. - Facebook photo from Governor Parson page. 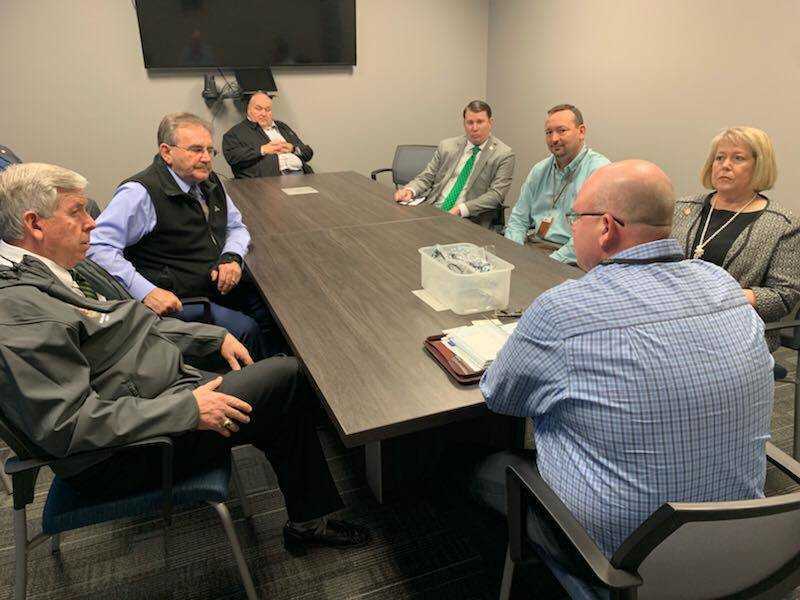 Late last week, the SRG Global-Portageville plant received a phone call from State Senator Doug Libla saying he would like to bring Governor Mike Parson down for a brief meeting with management and staff and take a tour of the new facility on Friday, Feb. 15. “Thanks to the folks at SRG Global for welcoming us to Portageville and giving us a tour of your facility. Our business climate in Missouri remains strong, but in order for businesses to succeed in the future, we must partner with companies like SRG Global to create a skilled workforce ready for the jobs of tomorrow,” said Governor Parson.